The highest tides in Europe are found at Mont St-Michel in Normandy, adding to the mystery and beauty of the site—and also to the danger. be covered by the sea! 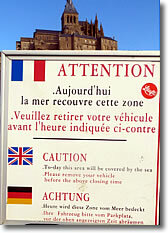 Each month the tides at Mont St-Michel have periods when they are extreme, and a few times each year they are dangerous. On about half of the days each month, extreme high tides almost turn the mountain into an island, while extreme low tides mean you'll need to squint off into the distance to convince yourself that there really is water in the Bay of Mont St-Michel. 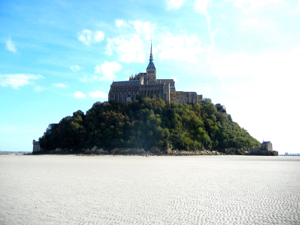 It is essential that anyone visiting Mont St-Michel be aware of the tides and plan accordingly, particularly if and when you walk on the sand around the island. There can be a difference of 15 meters (50 feet) between low and high tide! On about a dozen days of the year, the tides can be so extreme as to be dangerous, and they can change quickly. When wet, the sand can be unstable and a person can sink into it like quicksand, drowning as the tide rushes in. We have visited at times of extreme high tides and a time when we never saw any water around the island. Each has its appeal for the visitor. When the island is surrounded by sand, you canwalk all the way around it, seeing the Abbey, the walls, and other buildings from unusual vantage points. You can also participate in guided walks farther out on the sand to see the surrounding area. The highest tides tend to be after the full and new moons, so if you want to experience them, plan your visit accordingly. At the time of high tide, it is also dramatic to stand near the entrance to the Grande Rue of Mont St-Michel and watch the water rise, inundating the entrance, allowing the police at the Gendarmerie Nationale to set out in their small boat and circumnavigate the entire island to check on visitor safety, and even prompting surfers and sailboarders to launch their craft. You have to decide if you're going to stay on the island or on the causeway for the duration of the highest tide, because once the tide is full you'll be stuck in one place or another for a while. The high tide we experienced was early in the morning, and many people joined us on the causeway to experience it. 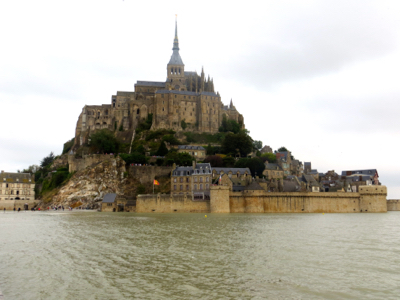 Mont St-Michel at high tide, with water completely surrounding the island. Quite a contrast to the picture above right, with no water! Over the years, the previous causeway allowed accumulations of silt around Mont St-Michel, and the area's maritime ecology was degraded. Recent efforts to restore the maritime heritage now allow the sea to move freely around the site. 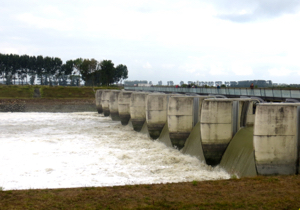 A new dam provides controlled filling and release of water designed to reduce silting and protect the environment and the new ecologically-beneficial approach-causeway to the island. The Office also has information on the timed release of water from the dam. If you are interested in the ecology of the Baie of Mont St-Michel, you might want to visit the ecomusée near Avranches. Click here for tide information from the Office du Tourisme. at low tide at Mont St-Michel. Rushing tidal waters at the dam at Mont St-Michel.